Our spacious guest room features contemporary decor with stylish furnishings including either one king or two double plush Hyatt Grand Beds, state-of-the-art media and work center with high definition 42 inch flat-panel television that easily integrates with laptops and other electronic devices , a comfortable cozy corner L-shaped sofa-sleeper, wet/dry bar and bathroom vanity upgraded with granite countertops. Enjoy complimentary hotel-wide wireless high-speed Internet. Heated indoor pool, exercise room with cardiovascular equipment. Three blocks to the largest mall in S.W. Virginia, Valley View Mall. 5 minutes off I-81 on I-581 exit 3E on Hershberger Road. 13 restaurants very near or within walking distance. Close to local companies and businesses, civic centers, and downtown. Everything is 5-20 minutes away. Located 1 mile for the Roanoke Regional Airport. 1104 square feet of meeting space. World of Hyatt members can enjoy our complimentary breakfast when they book an eligible rate. Our breakfast includes premium ingredients, cage-free eggs, and regional chef-inspired dishes. PET POLICY: 1-6 NIGHTS A 75 NON-REFUNDABLE FEE. 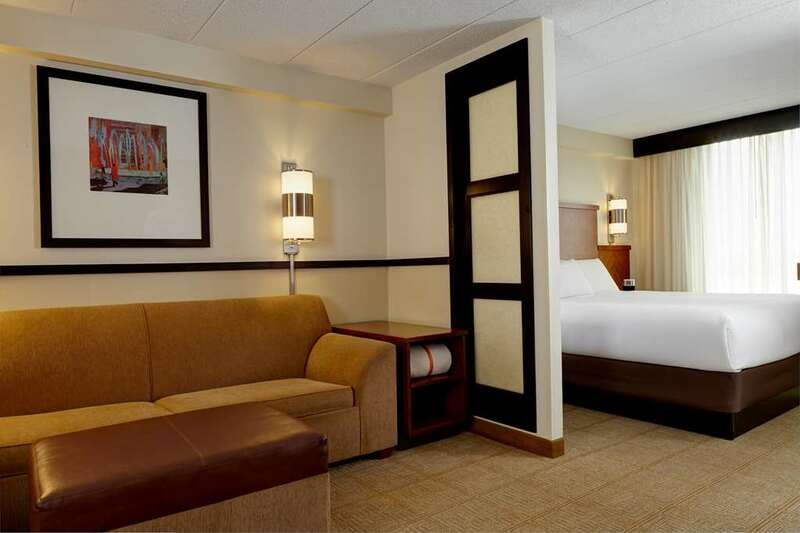 7-30 NIGHTS A 75 NON-REFUNDABLE FEE PLUS AN ADDITIONAL 100 CLEANING FEE. MAXIMUM OF 2 DOGS PER ROOM ARE PERMITTED. WEIGHT MUST BE 50 LBS OR LESS MAX OF 75LBS PER RM. FEES ARE IN USD. Located off I-81 exit 143 take I-581 South exit 3E to Hershberger Road. Take the first right turn onto Valley View North the hotel is located on the right behind The Red Palace Restaurant. 13 restaurants in the immediate area located at the largest Mall in S.W. VA, Valley View Mall. 1 mile from the Airport, 5 miles from downtown Roanoke, 5 miles from Salem and Vinton. 5 miles from the Roanoke Civic Center. Mill MountainLarge star erected on the top of the mountain in the middle of the city. Is lit at night. Overlooks and zoo near Blue Ridge Parkway. Roanoke Farmers MarketWorking Farmers Market plus numerous shops and restaurants in the heart of downtown. Also Science Museum, Taubman Museum of Art, History Museum. Valley View MallLargest mall in S.W. Virginia.